Ok. I've been slacking in writing about this stuff. We've also been traveling a bit and it's been fantastic. The last 2 weeks have been populated by peaches, plums, apples, melon, and blueberries. All of which we ate raw and at once. I actually supplemented our fruit supply with storebought fruit as well. Just leave it on the table and it disappears. We made raw salads out of the lettuce, and cucumbers and green beans during week 8. The leeks (3) and red potatoes and onion were used in a version of Manhattan Clam Chowder. I modified the recipe to contain Leeks, canned clams and juice (I KNOW! it was a weeknight!) and 3 or 4 HUGE heirloom tomatoes (more about those in a moment). I also made another batch of Borscht out of the beets and grilled up the japanese eggplants and broccoli. And with that: I was feeling uninspired. Didn't want to cook the same old stuff. Didn't want to write about it. HEIRLOOM TOMATO GLUT!! And fresh herbs and carrots and onions and cucumbers and flowers. To go along with the clam chowder (or so I told myself, Actually this could be a meal unto itself) I made a Crostata out of heirloom tomatoes, fresh sage, parsley and basil, and fresh picked caramalized onions. These ingredients were actually enough for 2 Crostata! Slice onion and caramalize it in a pan with about 2 tbsp of olive oil. Cook on low for 8-10 minutes until onion is wilted and light brown in color. Set aside. Put together the crust and then roll it out with a rolling pin On a surface that has been heavily dusted with Semolina Flour (I actually ended up using 2 crusts with this amount of veggies!). Spread the onions, oil and sliced herbs and garlic on the crust, then place the tomatoes on top and turn up the sides of the crust to prevent any of the goodness from leaking out. I then topped this off with some shredded Daiya Cheddar cheese and a tiny sprinkle of seasalt and the remainder of the chopped herbs. Bake in the oven for 15 minutes, take out, let cool a bit, and enjoy!! This week we got 2 pints of blueberries, 2 quarts of plums (purple and yellow), 1 quart of peaches, 3 cucumbers, 1 small head of lettuce, 1 bunch of beets, 1 large basil plant, and 1 bunch of radishes. 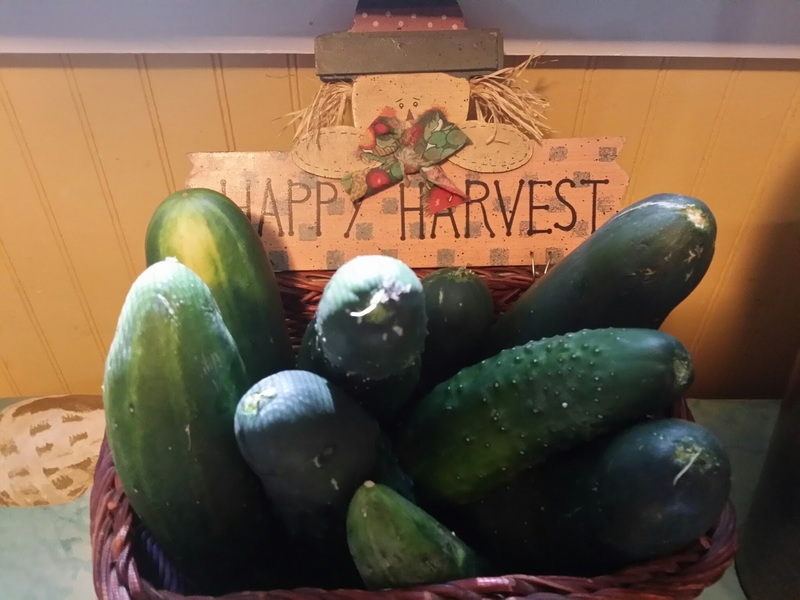 We also got about 3 quarts of green beans and 3 LARGE cucumbers from our neighbor! And even more cukes from my Mom's garden. I'll start by saying that ALL of these cukes have disappeared. Mark eats them whole as snacks and the kids like them sliced up. I also made a shredded radish/cucumber salad (sub 2 cukes for 1 bunch radishes) with cucumber and the bunch of radishes. The blueberries and ALL of the fruit were just set out on the table and have since disappeared. The lettuce was quickly eaten as dinner salads. The green beans were eaten raw (by the kids), and a bunch were stirfried with Tamari, Garlic, and a little sesame oil and served with baked tofu and brown rice. The beet greens were made into a delicious Greens and Beans with Smoked Pork. 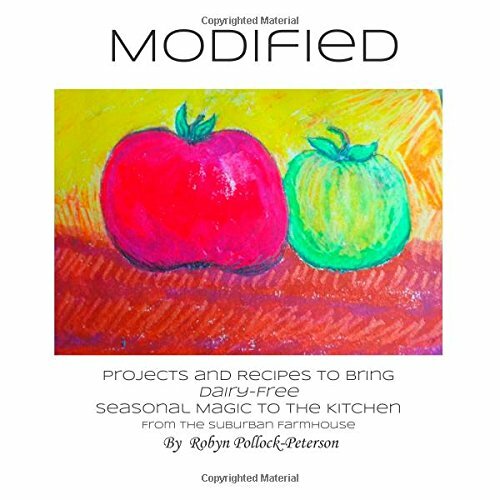 I will be making the beet roots into this AMAZING recipe for pickled beets. Alton Brown is one of my favorites and always knows what he's talking about!! And the basil I pinched back some leaves and planted the rest of the plant in the garden next to our renegade tomatoes. With any luck, by the time the tomatoes ripen, we'll have some extra basil to go with them. This week we actually went on a short (MUCH NEEDED) trip out of town. We still didn't have any problem finishing up all of our fruit/veggie share for the week. We'll be leaving for a long weekend at Grandma's house again in a couple of days, but I feel confident that next week will be equally easy for us to keep up with. 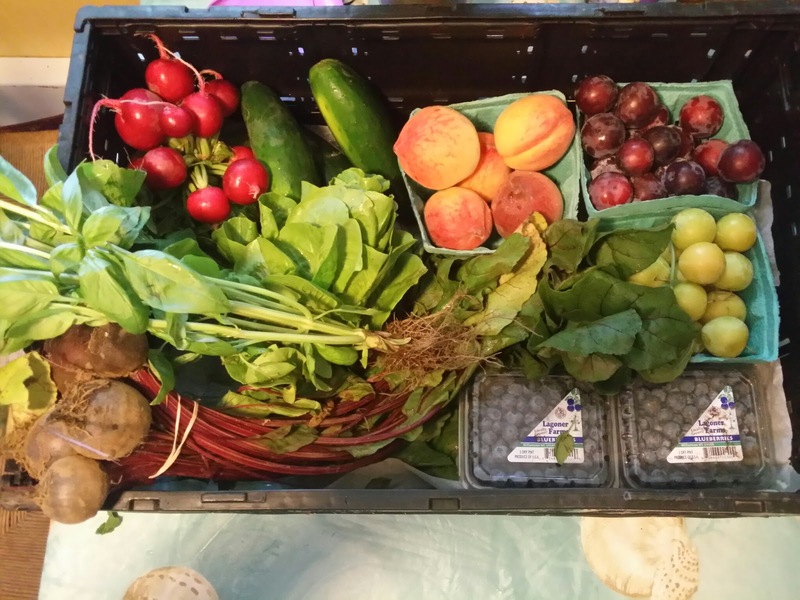 I wrote about how we had gotten some beets with our CSA share last week. Well, I cooked the greens a while back but the roots still remained. I have a recipe for Refrigerator Pickled Beets that I really LOVE which involves cooking the beets first and then pickling them in vinegar. This time I decided to try getting a little probiotic goodness in there as well. Put your beets and onions and thyme into wide-mouthed pint jars, leaving a bit of room on the top. Mix your brine in a quart mason jar. Top off the jars full of beets with brine. Hold down veggies under brine using bamboo scewers or weights. Allow to ferment at room temperature for 5-7 days burping as needed., When your desired flavor is achieved,transfer to the refrigerator. ENJOY!! 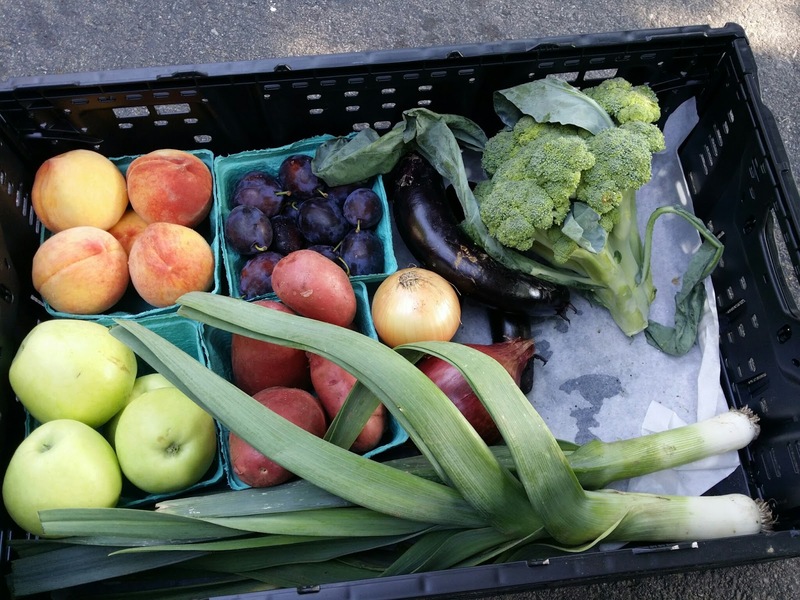 CSA Full Share Week 6: Nappa Cabbage and More Zucchini = Time for Kimchi, and Zucchini Soup! This week is highlighted with the appearance of a HUGE nappa cabbage. Perfect, I'll be making kimchi! I plan to tweak the recipe I used last time so as to make it spicy, but not SUPER spicy like it was last time. We pitted and froze the sour cherries, and the apricots and blueberries were eaten within the first day. The swiss chard was combined with the beet greens from last week. It was chopped, and sauted with bacon, onion, salt and pepper and made a great light dinner along with a crusty loaf a bread. The we got 2 small zucchini and put them together with a couple more we had laying around and made a batch of Ur Oma's Zucchini Soup! The green beans were used in a 3 bean salad and the head of leaf lettuce was made into side salads during the week.